HomeFootballNewsBlackburn funding crisis: what next for Rovers? Blackburn funding crisis: what next for Rovers? Blackburn Rovers’ owners have been asked by their bankers Barclays to make a £10m deposit into the club bank account by 31 December or else risk that they will burst their overdraft limit in the near future. One possible outcome in this scenario is that Barclays – quite legitimately – will refuse to continue funding the club, or indeed the players’ wages. There is no risk to December wages (due to be paid on 23rd of this month) and January will almost certainly be fine too; player sales and a £5.5m chunk of TV income are due next month. Beyond that, the situation is substantially less certain. The situation is explained in detail in this piece today in the Mail on Sunday, and the following Q@A explores the background and what might happen next. Q: What happened this week that changed the situation at Blackburn? A: At a meeting at Ewood Park this past week, on Tuesday, senior representatives from Barclays told senior club executives that the bank wants £10m deposited in the club’s account by 31 December, in line with long-standing contractual commitments made by Venky’s when they bought the club in late 2010. (See official offer document, note ‘a’). The owners are reluctant to provide this £10m, believing that the club’s own finances (gate money, TV money, perhaps player sales) can fund the day-to-day running of the club. Q: Why does the bank want the money now? A: Because the bank has waited for more than a year for the owners to make specific, pre-arranged capital injections over and above the £23m paid for the shares. And those payments, believed to be in blocks of £5m at set intervals throughout 2011, have yet to be made. The bank is concerned that without fresh capital – as agreed a long time ago – there is a danger Blackburn will exceed their agreed overdraft limit in the near future. If that happened, then Barclays would effectively be paying to run the club, rather than the owners. And given the global financial situation, Barclays don’t want to be funding the running of a football club without guarantees they’ll get their money back. Q: What is the overdraft situation? A: It is understood that the Rovers overdraft now stands at around £6m. This is down on the c.£17m that Venky’s inherited in late 2010, but the normal business of Rovers means that it potentially rises by £4m-£5m each month, mainly through salaries, and mainly because of player salaries. Hence a £6m overdraft today becomes £10m-£11m on the 23rd of this month, and without any new money, becomes £15m-16m on 23rd of January, and so on. The precise overdraft limit is known only by Venky’s and Barclays but it is understood to be more than £10m but lower than the level inherited (c.£17m). Hence within two months, if there was no fresh cash, it would be breached. Then, potentially, the bank and club have serious issues. Q: But the club does have fresh income, don’t they? What about all the TV riches of the Premier League? A: As you can see from the official Premier League document scanned in this article, Rovers made £42m from central Premier League funds in 2010-11, which works out to £3.5m per month. This season will be broadly the same, but that money is not paid evenly through the year. The biggest single chunk came and went in the summer, and for the rest of the current season, Rovers will get £1.7m a month, plus a ‘facility fee’ chunk of around £5.5m in January. Q: So this buys more time? A: Yes, but only to an extent. To sketch one scenario (and these figures are approximate, not necessarily exact), the overdraft will rise to c.£10.5m on payday on 23 December. Then it will decline to c.£3.3m in early January when £5.5m and £1.7m come from central funds, then rise to £8m on 23 January when the wages are paid, and by 23 February, it will be at around £13m and close to busting point. What cannot be avoided is that without fresh capital, the overdraft is in danger of busting within months. Hence the problem. Hence the demand. Q: What if Blackburn sell players in January? A: They almost certainly will, with Junior Hoilett due to be sold. He’s out of contract in the summer and has declined to sign a new deal. So it makes sense to cash in now. Whether he will fetch £2m or £5m is open to the market but it will only delay, not prevent, the longer-term problem. Hoilett would be a much more valuable player if under long-term contract. But interested clubs know he can move for nothing (or low-millions development compensation at most) in the summer. Q: What about a January transfer kitty? A: Given that the owners seem reluctant to give the bank £10m that is due, it’s hard to see where a transfer kitty is going to come from. And other areas of the club are facing cutbacks, including the coaching and scouting departments, to save money. Q: Can the situation be salvaged? A: Yes, if the owners make the simple decision to inject the money into the club. It’s quite simple, but they have shown no sign of wanting to do this, believing that the bank are being unreasonable. The owners feel the club can keep funding itself, as outlined above. The reality is, it can’t, and certainly can’t in the medium to long term. Q: Have the owners got the money? A: Yes. They are genuinely wealthy and successful business people, with an expanding portfolio of companies and huge property assets, not just in India. The bought Gary Neville’s house in the summer for around £6m, for example, to use as a north-west base. The issue is not whether they have the money: they have it, in India. But do they want to spend it on Blackburn? We’ll see. Q: But they always maintained they did. Star players. Big wages. Whatever it takes. A: Well yes. As this website knows only too well. See this series from January. But people change their minds. Or are disingenuous in the first place. 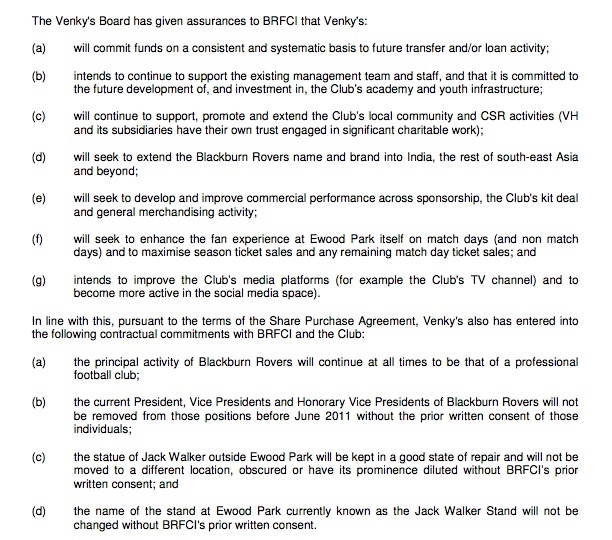 It is a personal view that Venky’s arrived with good intentions but were badly advised, massively badly advised, that they would be able to run Blackburn on its own resources, not injecting anything much over and above the initial £23m. They were genuine about their willingness and ability to fund wages for a ‘marquee’ player, but they have not been able to persuade one to join. My guess is that the recession has since bitten, the realities of needing more cash have started to dawn, and the owners are now at a crossroads. It was not clear to them until around March 2011 – after independent analysis of expenditure, especially transfer and agents’ fees – that the situation was going to need more cash than envisaged. Q: So it’s coming to a head? A: That seems to be the case. The club isn’t going to go pop within weeks. If the owners are prepared to inject around £10m a year, it might well be able to bob along, Premier League survival permitting, indefinitely. But if they’re not prepared to inject money, then the consequences are becoming obvious. As and when Mrs Desai is willing to answer questions, Sportingintelligence will be happy to ask them and report those answers. Q: What about some of the darker rumours we’ve all heard? A: Frankly, there has been a lot of nonsense written, mostly on message boards, about Steve Kean being some takeover mastermind, about dodgy deals and Premier League investigations, and about all manner of conspiracies. And it’s total tosh, the vast majority of it. The reality appears to be much more mundane: owners who are not rooted in football trusting the advice of people who sold them an unrealistic proposition; and those same owners not doing the necessary checks to see if that advice was honest and neutral. Everything since, including the exits of the old guard execs and the current situation, stems from that. The owners have been naive, and are responsible. They are not crooked. But Rovers’ fans do have the right to insight into how the situation reached the point it has reached. A: He’s got a football match to oversee on Sunday. Mrs Desai has remained his staunchest supporter, against the increasingly vocal advice of her most senior advisors.